Looking for a great breakfast spot in Jupiter? The Berry Fresh Café should hit the spot! The huge breakfast menu serves a number of homemade hashes, eggs benedict omelets and pancakes & Waffles. The O.M.G. Homemade Corned Beef Hash has slow roasted brisket, chopped with tri-color peppers and potatoes. Grilled and served with 2 eggs of your choice and a side of toast. They also have Mexican Hash, Fried Green Tomato Hash, C’sest si Bon Hash (with pickled beet and goat cheese), California Hash, and Chesapeake Bay Crab Hash. It’s like breakfast, lunch and dinner into one. All sorts of pancakes. The lemon Ricotta and Upside Down Pineapple Pancakes sounded most interesting. On the side is super crisp bacon, and awesome grits (try the OMG Shrimp-N-Grits). For the budget minded they have a $6.49 big breakfast meal with coffee. ( 2 eggs, red bliss potatoes, toast, two pieces of bacon or one giant buttermilk pancake, two pieces of bacon and coffee). There are an array of salads, burgers, sandwiches, and Panini’s. The atmosphere is one big great room decorated in yellow with brick accents. 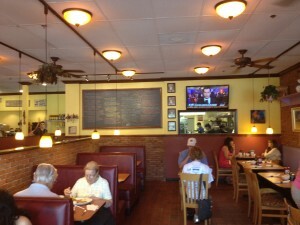 Ceiling fans, flat screens, and an old fashioned menu chalk board can be seen from any seat. Lots of cute signs like “kiss my grits”. The wait staff all have “Pink” Berry uniforms. Nearby are the Botanica Jupiter homes for sale. Posted in Jupiter homes, restaurant, Uncategorized on January 20, 2013 at 9:40 pm.